The revised UP General Education (GE) program will be rolled out in the first semester of academic year 2018-2019. In preparation for this, around 350 faculty members and administrators from UP’s eight constituent universities (CUs) met for the UP System GE Teaching Conference to discuss the teaching of the 11 GE courses common across the UP system and approved by the Board of Regents in December 2017. They likewise exchanged ideas on how to evaluate the revised GE program and address other implementation concerns. 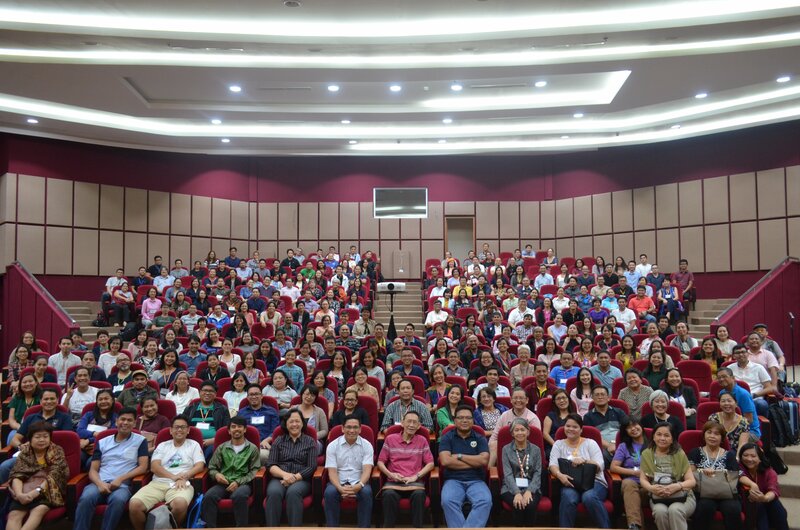 Present during the conference held from 11 to 13 July in UP Diliman were the vice chancellors for academic affairs, members of the GE Council, GE champions, GE module writers and coordinators, and GE teachers. At a plenary session, Vice President for Academic Affairs Maria Cynthia Rose Banzon Bautista talked about the changes made in the GE program in 1986, 2001 and 2010. The latest revision, initiated in 2013, aligned the GE program with a learning outcomes/student-centered education paradigm and the K to 12 reform. Such paradigm shift, according to Bautista, is necessary given the “changing realities spurred by globalization.” On why UP needed to adopt a learning outcomes approach to GE, she said that the “spirit underlying the GE objectives cannot be met without changing the way we look at our students and the way we teach.” The revised GE program has more enhanced focus on pedagogy and assessment with program evaluation designed from the start. Assistant Vice President for Academic Affairs (Curriculum) Alyssa Peleo-Alampay then recalled the process leading to the latest revision. This involved multiple consultations and mini-conferences at the CU level and three previous system-wide conferences–the first in 2014, the second in 2015 and the third in 2017 at which over 200 faculty members put together the course modules. An overview of the GE framework was given by Dr. Patricia B. Arinto, Faculty Regent and chair of the Technical Working Group for UP GE Program Implementation. She highlighted that GE pedagogy is governed by three principles: being learning-centered, resource-based learning and interdisciplinary approach. Also elaborated in her discussion were the reasons behind the development of the modules, such as the importance of appropriately designed and well-supported learning activities to support an outcomes-based approach to teaching and learning. As it is important to determine the extent and depth to which the GE program meets its expected outcomes, a TWG for GE Program Evaluation was created. The plenary talk of Associate Professor Fernando Paragas, a member of the TWG, covered end of semester monitoring using learning outcomes and program evaluation in 2022. A large part of the conference was devoted to concurrent workshops that allowed participants to examine and finalize the course modules. Special attention was given to the core or key texts for the required readings and the assessment of student learning and progress during and at the end of each course. The workshops also touched on the differences in GE class configurations, use of copyrighted materials and sharing of resources. The points discussed during the workshops were incorporated into the teacher’s guides that, together with the study guides for students, made up the modules. The GE program was opened for review and revision after the proposed Revision of the GE Program was introduced in 2013. Changes aim to adapt the GE to global and regional developments and the K to 12 reform while remaining committed to its liberal, holistic and integrative and non-utilitarian orientation, and promotion of the loftiest principles of a UP education including pagiging makatao and pagiging makabayan (humanism and nationalism). The conference was hosted by the Office of the Vice President for Academic Affairs.